During the season, reaping turkeys is one of the surest ways to march onward and upward towards filling a wild gobbler tag. So says Outdoor Channel personality David Holder, co-host of Raised Hunting along with his wife, Karin, and two sons, Easton and Warren. The tactic, which Holder says works on just about any wise old boss gobbler out there, can bring surprisingly high-success rates, even in the final days of the season when hunters are in a last-ditch effort to avoid eating an unused turkey tag. Holder says reaping a turkey – or using a decoy to fan a gobbler and crawl into lethal shooting range – is one of his best late season methods. As long as a hunter avoids these three big springtime turkey hunting errors, blunders in the field that can undo a great chance of success. “There’s so much more going on (in reaping a turkey) than just sitting against a tree or in a blind,” said Holder (www.raisedhunting.com). “And the truth is that nothing this good in terms of a solid hunting technique avoids having some drawbacks,” he added. What are a few of the mistakes to avoid when reaping a turkey? For starters, Holder says to protect yourself, especially in the prickly terrain of the Great Plains and American West. “Leather gloves are something you might want to use when you’re reaping turkeys,” said Holder, a former firefighter in the state of Montana who moved his family east to raise them hunting and chasing world-class whitetails in Iowa. “If you don’t, you might want to carry a good set of tweezers and fresh eyes to help remove the cactus thorns that you crawl over on your way towards Mr. Tom,” he laughingly added. While the Iowa terrain the Holders now hunt contains less in the way of cactus thorns, the concept is still valid there too with such things as locust thorns protruding off of a tree, sharp objects that often find their thorny way into the soft backside of a hunter not paying attention. And the same idea goes for venomous snakes – copperheads in Iowa or western diamondback rattlesnakes in the plains and mountain states – which can inflict damage on the hide of a hunter not paying attention as they crawl about. If avoiding unpleasant encounters with the thorned- or fanged-kind of threats is one mistake to avoid when reaping turkeys, a second is to choose the right terrain for the tactic. For starters, the more open the terrain is, the better off a hunter’s chances tend to be. Not to mention safer since safety is always the main concern when reaping turkeys. But while more open terrain is often the safest environment to seek, the idea is to get close enough to reap a turkey into surrender. This demands countryside with just the right amount of limited cover. “The best crawling terrain for turkey reaping is in grass that is about eight to 10 inches in height,” said Holder. In terms of turkey hunting, it means letting your eyes get you into trouble. “The biggest mistake I see people make (when reaping turkeys) is trying to look over the decoy,” said Holder. “And I mean that you should never look over the decoy since you always want to look under it, to the side of it or even through the fan itself,” he added. “The moment that you look over the tail-fan, they seem to figure it out since most gobblers know that a wild turkey doesn’t have a human face attached to its tail. While Holder says these mistakes can undo a potentially good turkey hunt where a hunter reaps his way into range, used correctly, the technique is amazingly successful. “We have found the last few years that reaping works just about any time and on any type of bird,” said Holder. 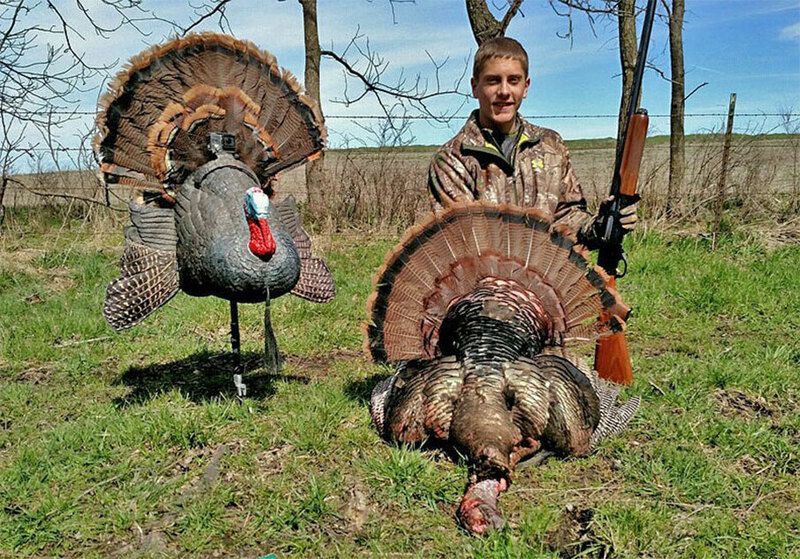 “Done safely and correctly, reaping is without a doubt the most effective legal turkey hunting technique (that I know of in recent years),” he added. While Holder admits reaping isn’t infallible – as can be said of any other hunting technique – it is something he and his family have used to fill a pile of gobbler tags in recent years, particularly on the open terrain of the Midwest, the Great Plains and the Rocky Mountain states. “We aren’t professional hunters, per say,” said Holder. 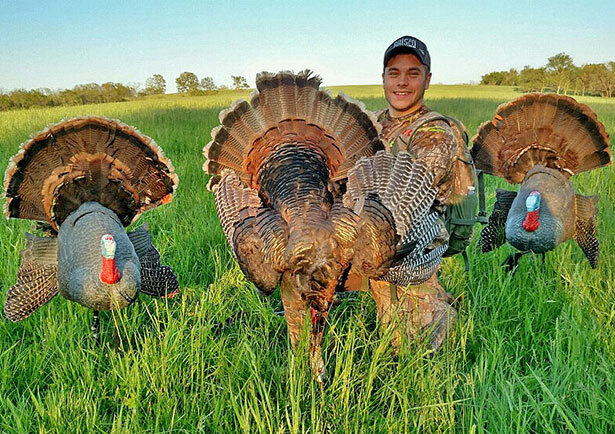 “We’re just people filming a television show that are able to get out and turkey hunt more than most people do each spring. “And we love sharing what we learn while we’re out there (both on our show and on our Web site),” he added. A woodsy education that in recent years has included learning how to reap a wild longbeard into gobbling and strutting his way into range, eventually giving up. All while Holder goes about his real work of being a husband and a dad who is rearing a couple of teenage sons who are Raised Hunting. Especially in the woods when a boss tom has nothing but love on his mind.